Markets are slightly higher on the last day of the year. Bonds and MBS are down. 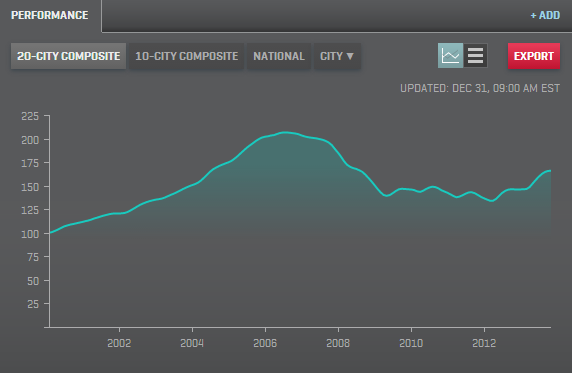 The Case-Shiller index rose 13.6% year over year in October. This was slightly higher than the Street estimate of +13.5%. This is the biggest gain since Feb 2006. Same old story – a restricted inventory of foreclosed properties keeps supply tight and offsets the cooling demand from increasing mortgage rates. Of course the first time homebuyer is the one who suffers the most in this situation – competing for a limited supply of low-end homes with professional cash buyers who don’t care what mortgage rates are. Short sales may be more difficult in the new year – the tax break on principal forgiveness ends. It appears that there is some sort of desire to extend this through 2014 – it may get bolted on to an extended unemployment bill. I wonder if Mel Watt was planning some sort of new HAMP initiative. Given the acceleration we have been seeing in Case-Shiller, by the time any sort of new government program finally gets ready for launch, home price appreciation may make the whole thing moot anyway. Markets are flattish on the penultimate day of 2013. Bonds have bounced back below 3% in yield. The ISM Milwaukee came in better than expected, and we will also get pending home sales later. Today is also Black Monday for losing NFL coaches. Leslie Frasier is gone, as is Rob Chudzinski. Are Shanny and Schwartz next? 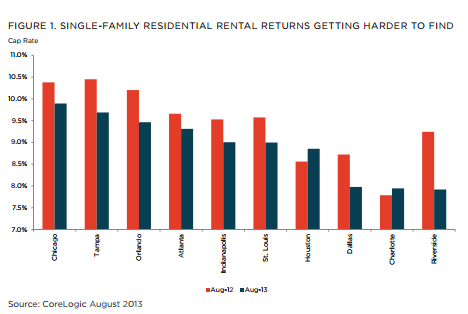 CoreLogic’s latest Market Pulse is out, and as usual it is full of good stuff. One thing they discuss is that cap rates are falling for rental markets as prices have increased. Which means that the bidding wars of professional cash buyers are probably over. As prices appreciate, expect to see the pros begin to ring the register. For originators, this means we can still have purchase apps increase as cash buyers drop from 40% of buyers back to their more typical 20% of buyers. The consensus is growing that 2014 will be the year the economy finally gets out of first gear. Job creation is back towards 200k a month, consumer confidence is rising, and 3Q GDP came in at +4.1%, though I wouldn’t read too much into that number. Pent-up demand is finally becoming unleashed. One thing to watch: if extended unemployment benefits aren’t renewed, we should see a drop in unemployment as people take part-time jobs to pay the bills. That won’t necessarily be an indication of economic strength, but it may matter psychologically. Posted on December 28, 2013 by Let the mutherfuker burn! Slap it and give it a name. Stocks are more or less unch’d while the 10 year bond is sporting a 3 handle. No economic data this morning. Builders are getting more and more into the jumbo business. You have seen average selling prices increasing (Toll Brother’s ASPs top 700k), but even the lower end ones like Lennar have ASPs over 300k). Some of the terms are quite attractive – 270 day locks, and lower down payments (like 10%). We saw it in the data last week, personal spending increased more than personal income increased. Does that mean we are going back to the good old (some would say bad old) days of consumers borrowing to fund a lifestyle they cannot afford? At this stage, the answer is probably “no.” Auto sales are looking great for the end of the year, but that is probably due to the record age of cars on the road – around 12 years. I have said it before – this is how recessions end. The consumer starts spending not necessarily because they want to, it is because they have to. You can only defer consumption so long. Eventually the clothes become threadbare, the car dies and needs to be replaced, etc. etc. Incomes will rise once some of the slack in the labor market is taken out. Separately, SpendingPulse reported that holiday spending increased 3.5% this year. The consumer is more optimistic than a couple of years ago, but isn’t back at 2006-2007 levels either. Discounts still reign supreme.The National Retail Federation is forecasting holiday sales will rise 3.9%. Stocks are higher this morning on no real news. Today is Boxing Day, which means a holiday for a lot of countries. Bonds are down again, with the 10 year bond yield flirting with a 3 handle. Initial Jobless Claims fell to 338k last week. The holidays invariably cause distortions in the data so it is tough to read too much into it. New Home Sales came in at 464k, a little better than expected. Sales in the Northeast and the West rose the most, while the South and Midwest lagged. At the end of October, there were an estimated 167,000 homes for sale, representing a 4.3 month supply. The median price jumped to 270,900 from 245,200 a year ago. Tony Crescenzi of PIMCO believes the worst of the selling is over. Notes that speculators have gone from huge net long positions in Eurodollar and Treasury futures to huge net short positions. The headline is misleading – he isn’t bullish on bonds in that he thinks yields are going higher, but he thinks the big dislocation happened last summer. In other words, mortgage rates aren’t expected to make another big sudden move higher. That said, pretty much everyone is in agreement that the economy is improving and 2014 could be the year that we finally break out of the post-crash malaise. You might want to note the date, because I am going to agree with a Brookings Institute economist for probably the first time in my life. Of course conventional wisdom is not always right – here were the big surprises of 2013. The Republican establishment is working to take back control of the party from the tea party activists that have controlled it since obama took over. What does that mean? No more dingbat candidates for the Senate. Or as the Chamber of Commerce strategist Scott Reed says: “No more fools on our ticket.” Actually I am surprised it took this long. Boehner doesn’t like them and he has all sorts of tools to bring them to heel. Maybe he should take away someone’s parking spot and put it in Anacostia as a way to send a message. Speaking of Congress, if it doesn’t act, mortgage relief will get a lot more costly. Beginning next year, anyone who has principal forgiveness on a short sale will get a tax bill. If Mel Watt decides to go the principal forgiveness route for conforming mortgages held by the government, he may find people less willing to play along. Also, extended unemployment benefits are scheduled to end starting next year, but there is a possibility that Congress will do something next year. If the benefits do lapse, we should see a drop in the unemployment rate as previously unemployed people take part-time jobs. Merry Christmas, McWing. And everyone else, of course. Stocks are unch’d on this short trading day. Stocks and bonds close at 1:00 pm EST today. Bonds are down. Mortgage Applications fell 6.3% last week, taking the index down to the lowest level since December 2000. Some of this is seasonal, as the spring selling season doesn’t really kick off until just after the Superbowl. Purchases were down 3.5%, while refis were down 7.7%. Durable goods orders increased 3.5% in November, rebounding smartly from an upward-revised -.7% in October. The print came in higher than the Street +2% estimate. Demand for autos is increasing which isn’t surprising as the average age of a car in the US is pushing 12 years, an all-time record. I have said it before – this is how recessions end. Eventually the consumer simply has to spend money to replace things, which increases demand, which increases employment and wages eventually. Consumers increase spending first, and then we get wage increases. Consumer Confidence rebounded in December to 82.5 from 75.1 the month before. 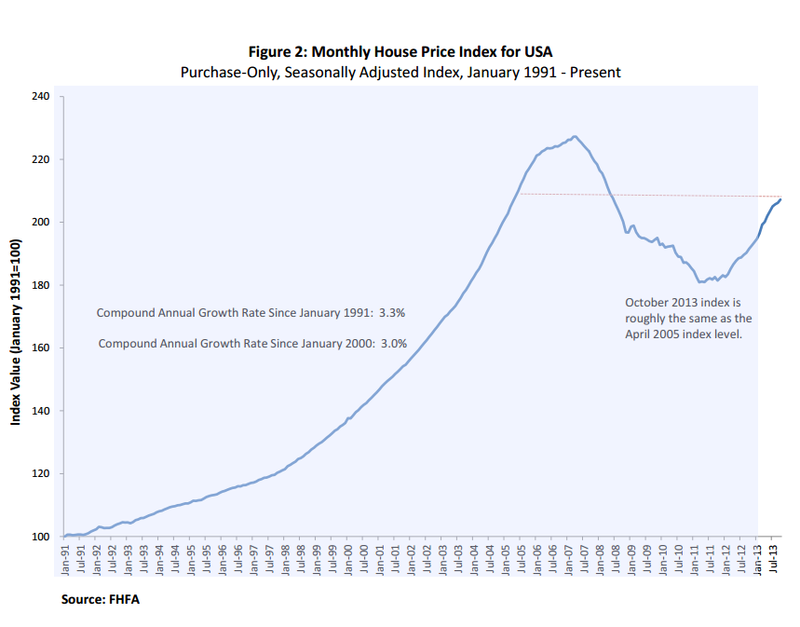 The FHFA reported that home prices rose .5% month-over-month in October. Year-over-year they were up 8.2%. The U.S. index is 8.8% below its April 2007 peak. This index considers properties with a conforming mortgage only, so it isn’t necessarily representative of the whole U.S. residential real estate market. Delinquencies ticked up 2.63% month-over-month according to LPS’s “First Look” mortgage report. Delinquencies + foreclosures are just under 4.5 million homes. Separately, FHFA announced that it has completed more than 3 million foreclosure prevention actions.